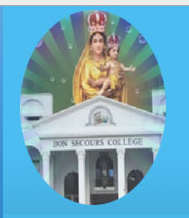 Bon Secours College for Women, Thanjavur was established by the Franciscan sisters of Lady of Bon Secours. The college is committed to guide and promote the educational interests of the poor and the downtrodden women. The objective of the college is to empower woman students by offering them quality education, to improve the status of the whole family by educating the girl students and to create awareness of moral values and mobilizing the girl students to work against social evils and discrimination of women. The mission of the college is to excel in helping students reach their full potential by developing their academic competency, critical thinking, civic responsibility and global awareness. Bon Secours College for Women, Thanjavur offers various graduate courses as well as Post Graduate courses. Bon Secours College for Women, Thanjavur is affiliated to Bharathidasan University, Tiruchirappalli. List of facilities available at Bon Secours College for Women, Thanjavur for students.